Last week we saw a Wanted poster of a pair of criminals from Overwatch without much else than their sketchy mugshots to go on. Today the Overwatch Twitter account gave us more in the form of a news report on these two. Junkrat and Roadhog are a criminal duo that specializes in bombing, arson and robbery across the globe. From Paris to London to Tokyo, they are hitting banks and fleeing the authorities. 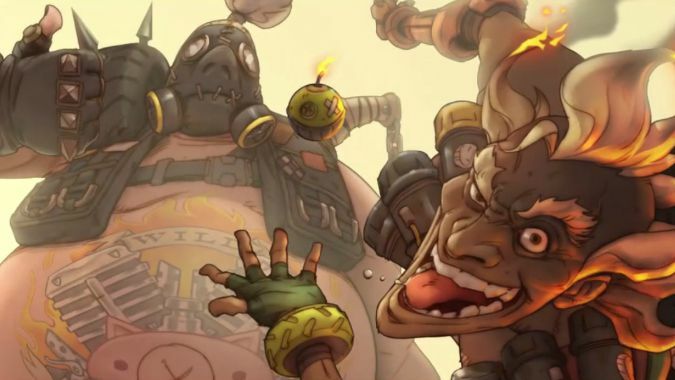 Junkrat appears to specialize in bombs and Roadhog has a chain with a hook on the end a la Stitches. Not much else is known about their gameplay and though they appear together in these teases, they likely can be played separately. These aren’t the first new heroes that aren’t associated with the Overwatch organization, but other than Widowmaker and Reaper, they are definitely the only ones that seem outright evil. Hopefully the next burst of information on these two from Blizzard will let us know more about how they play into the game.